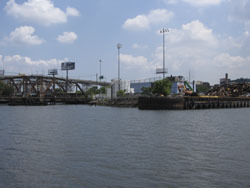 Newtown Creek at Dutch Kills is a tributary where subsistence fishing, as well as increasing kayak activity have been observed. The data displayed on these pages relates to the levels of sewage indicating microbes. Even though the levels on a single days can fall within acceptable levels for Enterococcus, these locations are not necessarily acceptable for swimming. Other water quality parameters not reported on this web site such as chemical contamination and floatables should cause users to exercise caution at this site.